Papers: Correspondence in Frank W. Boykin papers, 1911-1972; Pete Jarman papers, 1912-1964; Frank Murry Dixon papers, 1924-1965; Durr family papers, 1868-1968; and Clifford J. Durr papers, 1899-1976. Papers: 1945-1953. 3,619 items. In part, photocopies and microfilm from originals in the Harry S. Truman Library and the Weizmann Archives, Rohovoth, Israel. Correspondence and other papers relating to displaced persons, immigration of Jews to Palestine, the creation of an independent Jewish state, a truce between Israel and the Arabs, and other Jewish matters. Papers: In Frederick Henry Osborn papers, ca. 1903-1980; and Edward Uhler Condon papers, ca. 1920-1974. Papers: In Anna Kobrym Boyko papers, 1910-1973, reactions to election of Truman. Papers: 13 audiotapes (1945-1972) in Westinghouse Broadcasting Company collection, 1945-1981. Oral History: 13 pages. Journalism lectures series. Permission required to cite or quote. Also discussed in numerous interviews. Papers: Correspondence in Ferenc Nagy papers, 1940-1979; Michael T. Florinsky papers, 1914-1980; Vanguard Press records, ca. 1925-1985; Lenore Marshall papers, 1887-1980; Bennett Cerf papers, ca. 1898-1977; Samuel Irving Roseman papers, 1826-1967; Overbrook Press records, 1929-1978; Allan Nevins papers, 1912-1992; William Averell Harriman special envoy to Churchill and Stalin records, 1941-1946, 1951-1954; James Lawrence Fly papers, 1920-1977; Andrew Wellington Cordier papers, 1918-1975; Nicholas Murray Butler papers, ca. 1891-1947; Herbert Lehman papers, 1858-1963; Frank Altschul papers, 1900-1981; and Gilmore D. Clarke papers, ca. 1920-1980. Papers: In Child family papers, 1775-1940. Papers: Correspondence in Keen Johnson papers, 1870-1970. Papers: Correspondence in Alfred Abraham Weinstein papers, 1940-1976; Ralph McGill papers, 1853-1971, access restricted; and photographs in Dorothy Rogers Tilly papers, 1868-1970. Papers: In John McShain papers, 1925-1989; Maurice du Pont Lee papers, 1900-1973 (bulk 1952-1972); E.I. du Pont de Nemours Company, Atomic Energy Division records, 1942-1975; Hanford and Clinton records, 1942-1975 and Savannah River project records, 1953-1989, subject to 25 year time seal; material on special trains used by President Truman in Pennsylvania Railroad Company Motive Power Department records, 1881-1964; in Donald Fell Carpenter memoirs, 1945-1949; Crawford H. Greenwalt papers, 1928-1968 (bulk 1942-1968); J. Howard Pew papers, 1902-1971; and Philip D. Reed papers, 1927-1989. Papers: In Robert E. Sherwood papers, 1917-1968 (bulk 1934-1955). Papers: In William Henry Hastie papers, 1916-1976; Richard Hinkley Field papers, 1932-1978 (bulk 1942-1978); and Alger Hiss papers, 1923-1983 (bulk 1948-1952). Papers: Materials documenting Trumans role in 1960 presidential campaign in David H. Stowe papers, 1960; and in David E. Bell papers, 1947-1980. Papers: 1 signed copy of S. J. Res. 158, 80th Congress (June 29, 1948) in Sang autograph collection, 1751-1954. Additional Papers: Correspondence in David E. Finley papers, 1921-1977; Philip Caryl Jessup papers, 1878-1976; Harold Hitz Burton papers, 1896-1964; Robert A. Taft papers, 1885-1962; Charles Fahy papers, 1917-1976; and Lessing J. Rosenwald papers, 1819-1980. Oral History: Mentioned in oral histories in the John Stennis collection. Papers: 1937-1973. Ca. 40 items. Also photographs. Additional Papers: Correspondence in George H. Moore papers, 1864-1966; and Frank B. Nuderscher papers, 1916-1956. Papers: Correspondence in Butler Buchanan Miltonberger papers, 1940-1977. Oral History: Broadcast recording in WNYC radio station collection, 1938-1970. Advance notification required. Papers: Ca. 425 items of correspondence, including ca. 200 letters from Truman (1941-1970) scattered through several collections. Oral History: Discussed in interview with Robert E. Quinn (June 21, 1972-November 20, 1973), 358 pages. Papers: Correspondence in Edith Spurlock Sampson papers, 1927-1979 (bulk 1934-1979); Florence Ledyard Cross Kitchelt papers, 1885-1961; Anna Rosenberg Hoffman papers, 1870-1983; Frieda Hennock Simons papers, 1922-1960; Edith Nourse Rogers papers, 1854-1961 (bulk 1881-1961); Frieda Segelke Miller papers, 1909-1973; and Martha May Eliot papers, 1898-1979. Papers: In Lela Mae Stiles papers, 1914-1980; Anna Roosevelt papers, 1886-1976 (bulk 1933-1976); Nathan Straus papers, 1919-1961; Stephen J. Spingarn papers, 1945-1972; Henry Agard Wallace papers, 1941-1945; Charles W. Taussig papers, 1928-1948; Henry Morgenthau papers, 1866-1953 (bulk 1933-1953); Edward J. Flynn papers, 1913-1963 (bulk 1931-1952); Mary Williams Dewson papers, 1898-1961 (bulk 1921-1961); and Oscar Cox papers, 1933-1962. 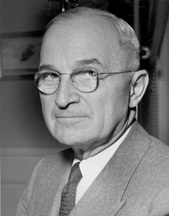 Also 440 items including detailed descriptions of conferences between Smith and Truman and memoranda concerning the budget, personnel, and other administrative matters in the Harold Dewey Smith papers, 1939-1946, photocopies available at the Harry S. Truman Library . Papers: Correspondence in Mary Teresa Norton papers, 1920-1960; and Archibald Stevens Alexander papers, 1939-1979 (bulk 1969-1979). Papers: Correspondence in Annette H. Peyser papers, 1945-1951; and Herbert Bruce papers, ca. 1930-1960. Papers: Correspondence in Norman M. Clapp papers, 1944-1989; Roger Sherman Greene papers, 1906-1946, on 2 microfilm reels; William Benton papers, 1951-1961; Alexander Wiley papers, 1913-1967; William Morris Leiserson papers, 1901-1959; Arthur Joseph Altmeyer papers, 1904-1973; Edwin Emil Witte papers, 1905-ca. 1967; David Susskind papers, 1935-1987; United Packinghouse, Food, and Allied Workers records, 1937-1982; George A. Sloan papers, 1917-1955; Dore Schary papers, 1920-1980; A. Merriman Smith papers, 1930-1971; Richard Halsworth Rovere papers, 1931-1968; Jacob Pankin papers, 1916-1964; Byron Price papers, 1901-1976; Hans v. Kaltenborn papers, 1883-1964; Patrick Hayes papers, 1942-1981; William Theodore Evjue papers, 1905-1969; Charles E. Broughton papers, 1916-1953; and Robert Bendiner papers, 1934-1984, on 17 microfilm reels. Papers: 1910-1972. 3,759 feet. Correspondence, memo- randa, reports, notes, speeches, press releases, trip files, scrapbooks, drafts of newspaper articles and books, publications, clippings, photographs, portraits, and memorabilia relating to his career as judge, senator, vice president and president, and to his life after public office. Includes 124 feet of senatorial and vice-presidential correspondence and papers, chiefly from his second Senate term. Most of the papers from the first term were destroyed. Includes 10 feet of family, business, and personal affairs papers. Open to researchers under restrictions. Finding aid. Additional Papers: In Francis W. Williams papers, 1947-1983; Lou E. Holland papers, 1926-1951; Benedict Karl Zobrist papers, 1968-1990; Thomas H. Van Sant papers, 1936-1956; United States Office of the Naval Aide to the President records, 1945-1953; Harold M. Slater papers, 1953-1972; Charles G. Ross papers, 1901-1967; David K. Niles papers, 1912-1952; Charles S. Murphy papers, 1947-1981; Edward P. Meisburger papers, 1921-1977; Arthur Mag papers, 1953-1967; Edward B. Lockett papers, 1975; Mary Paxton Keeley papers, 1944-1963; Truman centennial collection, 1981-1985; Harold Foote Gosnell papers, 1958-1977; Elmer Gertz papers, 1949-1960; Rose Conway papers, 1945-1959; Matthew J. Connelly papers, 1945-1953; Hugh Fulton papers, 1938-1958; Colgan-Bruner family papers, 1835-1975; Inaugural committee records, 1948-1949; National Security Council records, 1945-1953; White House bill file, 1945-1953; presidents secretary files, 1945-1953; Map room files; Psychological Strategy Board records, 1951-1953; naval aide to president files, 1945-1953; White House central files, 1945-1953; and Democratic Party National Committee records and clippings, 83 feet. Oral History: 1962-1986. 10 transcripts. Interviews with persons associated with Truman during his service in World War I, chiefly with the 129th Field Artillery. Access partially restricted. Oral History: 1961-1988. 55 transcripts. Interviews with friends and neighbors of Truman and his family. Oral History: 1964-1971. 13 transcripts. Interviews with Senate staff members and other government employees who were associated with Harry Truman when he was a senator. Oral History: 1963-1988. 36 transcripts. Interviews with White House staff members during the Truman administration. Access partially restricted. Oral History: 1964-1988. 9 transcripts. Interviews with officials and staff members of the Democratic National Committee during Truman administration. Access partially restricted. Oral History: 1966-1987. 21 transcripts. Interviews with newspapermen who worked in the administration of President Truman. Oral History: 1960-1988. 111 transcripts. Interviews with U.S. government officials during the Truman administration. Access partially restricted. Papers: Correspondence in Neal Bishop papers, 1949-1950; Maurice C. Latta papers, 1897-1947; and James G. Patton papers, 1920s-1970s. Papers: Correspondence in Harry Huffman papers, 1909-1960. Papers: Correspondence in Eugene Robert Black papers, 1917-1974; and Milton Luther Fleetwood papers, 1836-1966. Papers: Correspondence in George Murphy papers, 1911-1961; Arthur Hendrick Vandenberg papers, 1884-1974; Stella Brunt Osborn papers, 1889-1949; Frank Murphy papers, 1908-1949; Margaret Bayne Price papers, 1918-1969; Isaiah Leo Sharfman papers, 1914-1962; James Kerr Pollock papers, 1020-1968; Blair Moody papers, 1928-1954; Frank A. Picard papers, 1907-1963; Jay G. Hayden scrapbooks, 1916-1965; Malcolm Keith Hatfield papers, 1930-1961; Albert Joseph Engel papers, 1911-1959; Lloyd Cassel Douglas papers, 1900-1954; Prentiss Marsh Brown papers, 1902-1973; Read Bain papers, 1893-1972; and William Haber papers, 1918-1988. Papers: Correspondence in Felix Forte papers, 1927-1975; Edith Koivisto papers, 1903-1981; and John Panchuk papers, 1910-1981. Papers: 1937-1973. 5 folders. Miscellaneous letters, speeches, and ephemera. Also photographs, portraits, and memorabilia. Finding aid. Additional Papers: Correspondence in Champ Clark and Bennett Champ Clark papers, 1853-1973; Thad Snow papers, 1921-1954; and Robert Washington Selvidge papers, 1918-1942. Papers: TV scripts and notes for Truman TV series in Arthur Heinemann papers, 1910-1978. Papers: Correspondence in International Union, United Automobile, Aerospace, and Agricultural Implement Workers of America presidents office Walter P. Reuther collection, 1933-1970. Access partially restricted. Papers: 1949-1971. 93 items. 78 letters (1949-1971); related correspondence (1951-1964); and 3 photographs. Papers: In Jennie A. Pieters papers, 1928-1939. Papers: Grahams relationship with U.S. presidents, 1863-1973. Papers: Correspondence in Henry Agard Wallace papers (1888-1966), on 67 microfilm reels of originals in University of Iowa Libraries; Max Lerner papers, 1927-1980; Harold Phelps Stokes papers, 1908-1969; John Collier papers, 1910-1987; William Adams Delano papers, 1902-1960; Jerome New Frank papers, 1918-1972 (bulk 1929-1957); R.C. Leffingwell papers, 1883-1979; Dwight McDonald papers, 1865-1984 (bulk 1920-1978); Harry Shulman papers, 1922-1955; James William Fessler papers, 1918-1991; Henry L. Stimson papers, 1846-1966); Dean Acheson papers, 1898-1986; Palestine Statehood Committee records, 1933-1972 (bulk 1939-1949); John Sylvester Fischer papers, 1907-1980; Edward Joseph Logue papers, 1931-1975; and Alfred White Van Sinderen collection, 1782-1969. Research Libraries Information Network In addition to the institutions listed above, items are also cataloged in collections at: American Institute of Physics, Niels Bohr Library, New York, NY; California State Archives, Sacramento, CA; Clemson University Library, Clemson, SC; Community Library Association, Ketchum, ID; Cornell University Libraries, Ithaca, NY; Dartmouth College, Hanover, NH; Hadassah Archives, New York, NY; Johns Hopkins University Library, Baltimore, MD; Rockefeller Archive Center, North Tarrytown, NY; Smithsonian Institution, Archives of American Art, Washington, DC; Stanford University Libraries, Stanford, CA; Syracuse University, George Arents Research Library, Syracuse, NY; Temple University Libraries, Philadelphia, PA; University of Michigan, Genese Historical Collections, Flint, MI; University of Oklahoma, Norman, OK; University of Oregon, Knight Library, Eugene, OR; University of Pittsburgh Libraries, Pittsburgh, PA; University of Toledo Library, Toledo, OH; University of Virginia, Alderman Library, Charlottesville, VA; and Western Kentucky University Library, Bowling Green, KY.